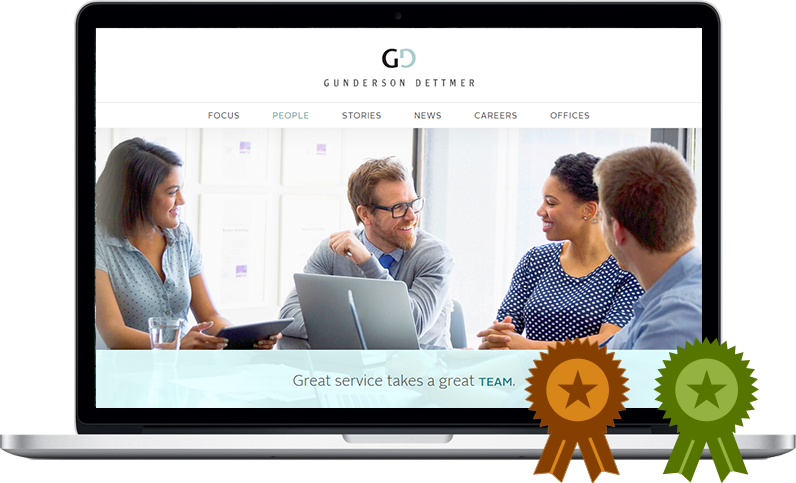 The firm: Gunderson Dettmer is the world’s leading law firm serving high-growth technology and life science companies and venture capital firms. The challenge: Since its 1995 founding in Silicon Valley, the firm has grown steadily from a handful of lawyers to over 240 attorneys in 9 offices in the US, China, and Singapore. It needed a website that reflected its status as the dominant law firm for venture investors and emerging companies. 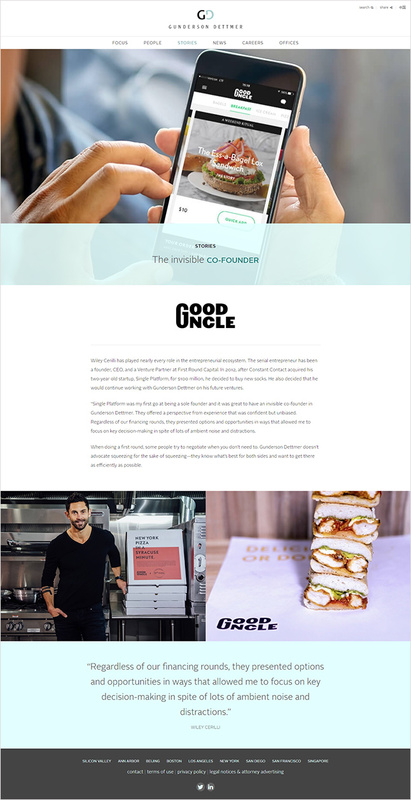 The firm also sought to use stories of how it has helped clients grow and thrive, to demonstrate its unique value proposition. The Gunderson website was created by Great Jakes based on concept designs by Fine. 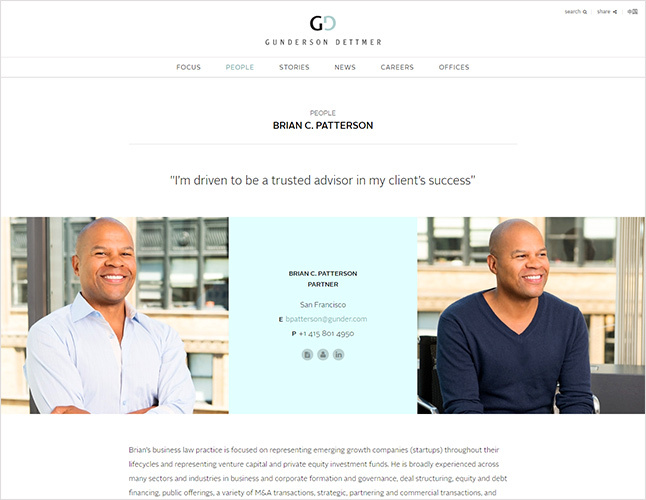 The website prominently features a collection of “client stories” that describe some of the firm's most successful client relationships. These stories demonstrate how the firm partners with early-stage startup companies, helps them navigate the maze of financing and growth, and supports them in their later stages through M&A or IPO. Attorney bios open with an oversized personal quote that allows lawyers to share a little of themselves. The bios also feature two side-by-side portrait photos that enable attorneys to show more personality. Using a simple interface within the content management system (CMS), the bios can be further customized to include logos of selected clients, with the added benefit of telling the story through text and images. Throughout the website, “Spotlight Carousels” highlight the firm’s accomplishments. The carousels feature testimonials, factoids and other statistics, and client vignettes and can easily be deployed on each page using a drag-and-drop interface within the CMS. To allow for consistent display of client logos throughout the site, a custom logo database was built into the CMS. Logos in the database can be applied to a page with one click and rearranged using a drag-and-drop interface. To-date, there are nearly 200 client logos in the system, and those logos appear on numerous pages on the site. To achieve a more modern look-and-feel, attorney bios feature two portraits: one seated and one standing. The large, engaging photos are designed to create an emotional connection with website visitors. Portrait photography was shot by Ben Krantz and Paul Quitoriano. 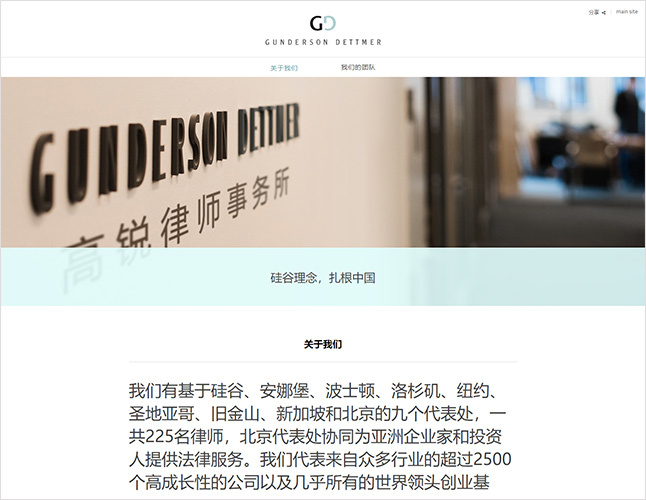 To support the firm's growth in the Chinese market, the website includes a section written in Simplified Chinese. Visitors can easily switch between the Chinese and English versions using a link in the primary navigation. Several attorneys also have bios in both languages and a means for visitors to toggle between them.